The European Commission just announced it’s fining four consumer electronics manufacturers a total of €111 million for fixing online resale prices. 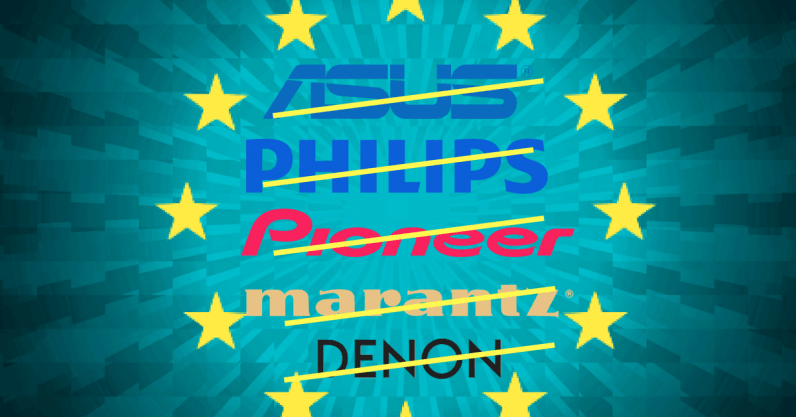 The four companies — Philips, Pioneer, ASUS, and Denon & Marantz — all had their fines reduced due to cooperation with the EU. EU Commissioner Margrethe Vestager — who made the headlines earlier this month when the EU fined Google for a record-breaking €4.34 billion ($5 billion) — said in a statement that as a result of the actions of the four manufacturers, millions of Europeans faced higher prices for consumer electronics, such as kitchen appliances, hair dryers, notebook computers, headphones, etc. “This is illegal under EU antitrust rules. Our decisions today show that EU competition rules serve to protect consumers where companies stand in the way of more price competition and better choice,” said Vestager. All the companies engaged in what’s known as “fixed or minimum resale price maintenance (RPM)” by pressuring online retailers to set prices to the manufactures’ liking — i.e. preventing the price from becoming too low. The EU says that retailers were faced with “threats or sanctions such as blocking of supplies” if they didn’t comply with the ‘requests’ of the manufacturers. The four companies were all fined separately depending on the extent of their price manipulation. ASUS received the biggest fine, €63.5 million, for intervening with with retailers in France and Germany in 2011 to 2014. When retailers sold computer hardware and electronics products below the resale prices ‘recommended’ by ASUS, the company requested the retailers to increase their prices — at the cost of European consumers. The EU Commission states that it’s clear the price interventions of ASUS, Pioneer, Philips, and Denon & Marantz limited effective price competition between retailers and led to higher prices with an immediate effect on consumers. For more information on the antitrust fines, you can find the official press release here. And cheaper non-price-manipulating hairdryers here.